This role has no restrictions, it has access to every area of ServiceM8. 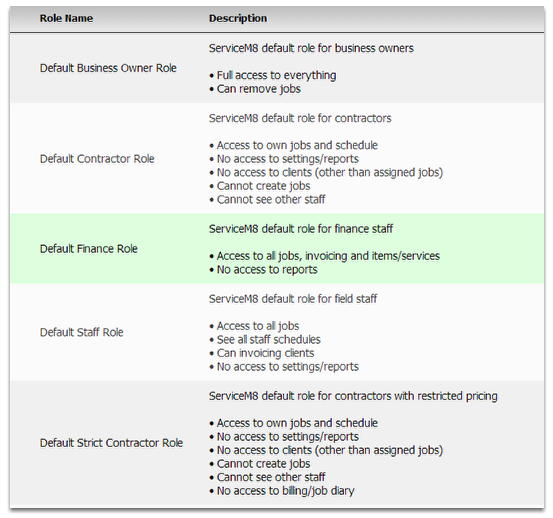 Finance role is restricted from accessing reports and isn't permitted to remove jobs. Staff role has the same restrictions as the finance role but also restricts access to settings. Contractor role has the same restrictions as Staff and Finance role's but additionally restricts access to all jobs except jobs assigned or scheduled to them, restricts their access to clients, they cannot create new jobs and they cannot see other staff. Strict Contractor role has all the restrictions of the previous roles, but also disables the diary and billing tab on the app, this setting is required if you don't want the worker to see pricing. The reason the diary has to be disabled is because invoices, emails and quotes are all stored there, so some functionality of ServiceM8 will be lost through this setting.